Anyone attempting to make sense of calculations surrounding carbon cycling and soil carbon must first understand a little bit about quantities and conversion factors. Here are some basic facts you might find helpful. First off, much of this literature uses the metric system of measurement. In case you forgot your high school lessons on the metric system, here are some useful conversions. More and more agricultural scientists are beginning to recognize that there is a wondrous world just beneath our feet. We know very little about it, so far. But what little we are learning is staggering. This paper explains how atmospheric carbon is introduced into the soil and how it is stored in stable forms. It identifies the farming techniques that are responsible for the decline in soil carbon and gives alternative practices that do not damage carbon. Increasing soil carbon will ensure good production outcomes and farm profitability. 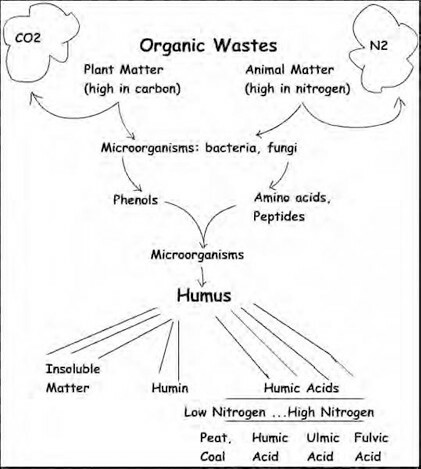 Soil carbon, particularly the stable forms such as humus and glomalin, increases farm profitability by increasing yields, soil fertility, soil moisture retention, aeration, nitrogen fixation, mineral availability, disease suppression, soil tilth and general structure. It is the basis of healthy soil. The capacity for appropriately managed soils to sequester atmospheric carbon is enormous. The world’s soils hold around three times as much carbon as the atmosphere and over four times as much carbon as the vegetation. Soil represents the largest carbon sink over which we have control. When atmospheric carbon is sequestered in topsoil as organic carbon, it brings with it a wealth of environmental, productivity and quality of life benefits. An understanding of the ‘carbon cycle’ and the role of carbon in soils is essential to our understanding of life on earth. Over the last twenty plus years of intensive vegetable growing at Tobacco Road Farm, we have constantly sought ways to improve the health and vitality of our crops and soils. Much of the land grows vegetable crops year round so the intensity of production demands very careful soil care. To this end, soil amendments, fertilizers, inoculants, and compost have been carefully selected and applied over the years in no small degree. The soil foodweb of microflora and microfauna constitutes an underground engine of fundamental significance to plant productivity. 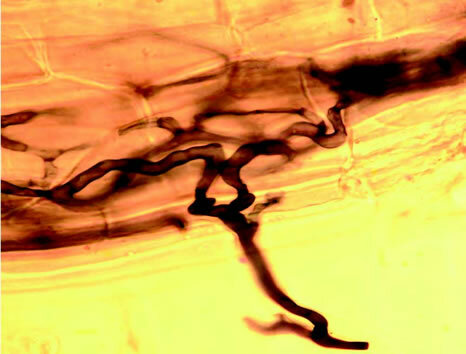 Mycorrhizal fungi play a key role in the functioning of this foodweb, drawing down plant sugars derived from photosynthesis and providing much needed energy for the soil ecosystem. Mycorrhizal fungi also improve aggregate stability, enhance soil structure, build stable soil carbon, improve plant water use efficiency and increase the efficiency of utilization of important nutrients like phosphorus, sulphur and nitrogen. Agricultural research tends to focus on conventionally managed crop and pasture lands where loss of diverse perennial groundcover and/or intensive use of agrochemicals, have dramatically reduced the number and diversity of soil flora and fauna, including beneficial microbes such as mycorrhizal fungi. As a result, the potential contribution of soil biology to agricultural productivity has been greatly underestimated. Nitrogen is a component of protein and DNA and, as such, is essential to all living things. Prior to the Industrial Revolution, around 97% of the nitrogen supporting life on earth was fixed biologically. Over the last century, intensification of farming, coupled with a lack of understanding of soil microbial communities, has resulted in reduced biological activity and an increased application of industrially produced forms of nitrogen to agricultural land. Globally, over $100 billion of nitrogen fertilizers are applied to crops and pastures every year. Between 10 and 40% of the applied N is taken up by plants. The other 60-90% is leached into water, volatilized into the air or immobilized in soil. Like many NOFA members, Janet Clark and her husband got into farming in their mature years. Having grown up on an Illinois farm with a hard driving father, Janet’s husband never wanted to go back to that life again. But he helped her with her dream. Thirteen years ago they bought a 70-acre dairy in Ashfield, Massachusetts to raise beef. For ten years they came out from the Boston area on weekends to build fences, fix buildings (new roofs, a bigger well a new electrical system) and move stock. Three years ago they made the big move out themselves. He runs a small business from a home office, and she runs the farm. In this paired site comparison, parent material, slope, aspect, rainfall and farming enterprise are the same. Levels of soil carbon in both paddocks were originally the same. On the Left Hand Side (LHS) is a 0-50 cm soil profile from a paddock in which groundcover has been actively managed (cropped and grazed) to enhance photosynthetic capacity. Q: Is it fair to say that carbon is the key ingredient that makes the difference between barren, unhealthy soil and fertile, healthy soil? A: Yes. The glues and gums that hold soil particles together in the form of aggregates (small lumps) are made from carbon. Aggregation is what gives soil its tilth – making it well-structured, porous and friable. Porosity, in turn, improves the infiltration and storage of water. Carbon derived from plants also provides the energy for the soil biota essential to nutrient availability. Plants give to the soil, rather than take from it, as many people believe. The greatest threat to soil health is bare ground. When soil lies in bare fallow for long periods (eg. between crops) – or if it is over-grazed and has bare patches – it will deteriorate. Around 80-90% of plant nutrient acquisition is microbially mediated. If there’s no energy for the microbes (in the form of carbon) there will be very little nutrient – particularly vital trace elements – for plants. These deficiencies are passed along the food chain to animals and people. Wetlands, rivers, oceans, lakes, plants, decaying vegetation (especially in moist environments such as rainforests) – and a wide variety of creatures great and small – from termites to whales, have been producing methane for millions of years. The rumen, for example, evolved as an efficient way of digesting plant material around 90 million years ago. Ruminants including buffalo, goats, wild sheep, camels, giraffes, reindeer, caribou, antelopes and bison existed in greater numbers prior to the Industrial Revolution than are present today. There would have been an overwhelming accumulation of methane in the atmosphere had not sources and sinks been able to cancel each other over past millennia. It is spring planting time, and most farmers are out planting seeds. 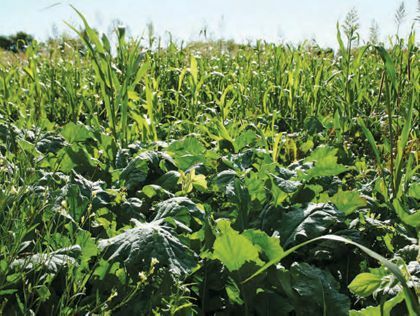 The process of developing varieties of plant traits is as old as agriculture and farmers have been selecting seed from plants they like and replanting it for generations. They use open pollinated (OP) seed in this process, which in nature creates new varieties by spreading pollen to flowers randomly. When grown in isolation from cross-pollination with different same species, however, OP methods are designed to produce seed offspring very similar to the original parent population. OP seeds will grow ‘true-to-type’ generation after generation. Heirloom seeds are open-pollinated and have been handed down by seed savers for many years.